The most common words I hear from potential clients is: “I’m stuck.” Sound familiar? You know you want to surround yourself with beauty and feel that things are put together, but it is oftentimes overwhelming to know where to begin to create what we want. Let’s talk about how to get started, whether your room is indoors or outdoors, we can tackle them the same way. When I first begin work with a new client, I always sit down with them and ask a series of questions. One of the first topics we discuss is what the client intends to use the space for and what sorts of activities will take place in that room. Defining a specific purpose for your room, and even spaces within the room, really helps to zero in on some basic information that will be useful as you begin to design. You can apply this to indoor or outdoor room design. For outdoor rooms, even if you have no yard and only a front step to work with, a space can have a purpose! With a front door, it is a place to welcome guests as they knock on your door! It is “the welcoming space.” Just knowing that small piece of information can help you decide what to do with the space you have. From there you can design a “room” that will function and be aesthetically pleasing. You can assign purposes several times over within a room. You might have a room that has to accommodate both eating and relaxing, for instance. So now that you have defined two purposes of the room, you can begin to create rooms within rooms. In both big or small spaces, every nook can be assigned a purpose. Dividing a room up by several purposes makes it much easier to design than if you just call a room a “living room,” for instance. 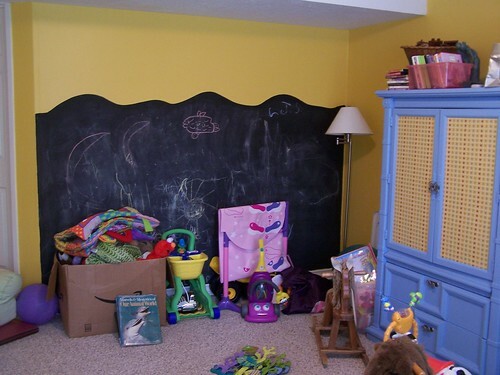 Below is a playroom of a client who called me with those common words, “I’m stuck.” She didn’t need any new furniture and her room was already cute, but she knew something was wrong because her kids didn’t want to play there. This is a big clue that something is wrong with your space. If you don’t want to go there, that signals a problem. The problem was it simply wasn’t arranged with specific purposes in mind. Calling it “a playroom” was not specific enough. We needed to create zones, or rooms within the room. By simply creating two distinct spaces, I was able to create play zones that made sense for the kids. One area became the reading/TV nook, and the other was the “arts & crafts” zone. Each space you are designing needs to have a specific purpose so that you can know where to focus and how to solve the problems. In this case, it only required switching two pieces of furniture. By simply defining the room and spaces within a room, whether your room is inside or outside, you can start to envision spaces that serve a purpose, rather than just a big design dilemma. Next posts in this series (which will at times address both indoor and outdoor rooms) we’ll talk about problem solving in room design and then start to discuss the specific components we need to create inviting rooms. TTFN! I’ve always been intrigued by outdoor rooms. The outside is always so full of creative possibilities! My husband and I spent many hours in our last two houses designing and creating living areas that stretched the borders of our home. I love the idea of taking some of the same design principles we use on the inside to create special spaces outside. We bought our current house As Is, which as I’ve explained before, meant it was sorely neglected. Because we’ve had to spend so much time and money bringing things up to speed, decorating both inside and outside has taken a backseat to more fundamental issues. Nevertheless, our backyard is begging for some attention. As I was thinking through what could be done with limited money, time or manpower (story of my life, darn those limitations! ), I started to consider basic design principles that would help me get going on the project. I’m not a gardener by any stretch of the imagination, but a lot of the same principles I use for creating style and function inside a home apply to the outside too. More often than not, we can accomplish a lot just with creativity. That is good news for those of us who have access to more creativity than funds. To explore some outdoor room ideas, I will do a series of posts coming up periodically over the next few months sharing creative inspiration for designing outdoor spaces. I’ll even do a few Drive Bys in my own neighborhood to illustrate some points! READER PARTICIPATION: I could use your help on this! If you have some creative ways to define, create or decorate outdoor rooms, email me! I’d love to share your photos and ideas over the course of our series (which will go on periodically over the next few months) so start gathering your outdoor room inspiration!